Humour is not the first thing that comes to mind when you think of accountants and lawyers, but somehow, a joke has slipped into the South African Tax Code. Although straight-line depreciation is the simplest method, it is (for most types of assets) not an accurate reflection of reality. The true value of most assets depreciates faster when they are new, so the taxpayer should be able to claim higher tax deductions earlier in an asset’s life (which, of course, helps cash-flow). The “declining-balance” method is the logical solution to this inaccuracy, but it introduces another problem: assets never reach the end of their life, but just decay away ad-infinitum, burdening the accountant with inconsequential little bits and pieces of depreciation from ancient assets. Now, the South African Revenue Service clearly tried to emulate this widely-used system, but somehow ended up using the same rate (e.g. 20% for a 5-year asset) for both methods. Unfortunately this defeats the object. 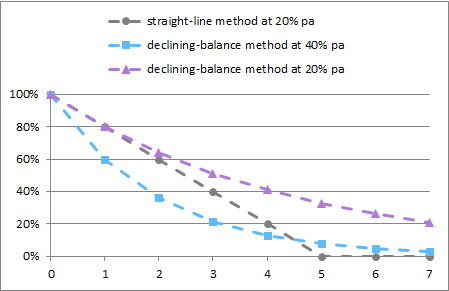 From the plot above, the declining-balance method at 20% pa clearly has a much longer life than 5 years. In fact, the method leaves the asset with 33% of its original value at what was supposed to be the end of its life. Soon enough, the taxpayer will realize that, for all his accounting efforts, he is only getting left behind, and switch over to the straight-line method. 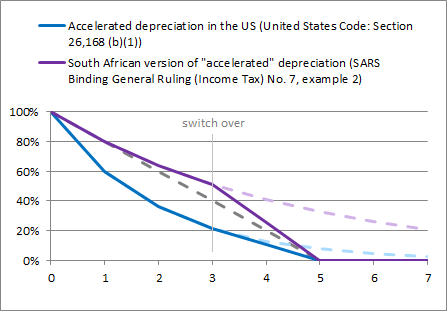 This gives us a very unique South African version of “accelerated” depreciation, which can more accurately be called decelerated depreciation. Other countries’ tax codes say: You can claim accelerated depreciation, but it requires more comprehensive accounting. SARS says: You can do the thorough, comprehensive accounting, but then you will have to lend us additional money. So just forget about it and use the straight-line method.